The hotel is located in the greenbelt on the bank of the ancient Dnieper. Here you will make yourself at home! At your service: cozy cottages, restaurant, billiards, sauna. The territory is guarded. This wonderful place is a good choice for both rest and evening parties. Location: 8 km from Smolensk in the village of Vysokoe. There is a small hotel consists of 12 guest houses with amenities. The guest houses are double and single. Extra sleeping accommodation for a child is available. Inside the houses: a double bed, satellite TV, shower and toilet, warmed floor, fireplace. The big guest houses accommodate 4 persons. Extra sleeping accommodation for a child is available. The houses of this type are equipped with dwelling entresols. Dwelling entresol: a double bed, satellite TV. 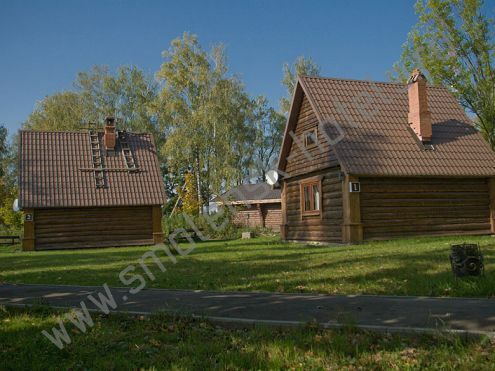 In the big guest houses there is a sauna for 2-3 persons. On the first floor there is a sauna, a room with a fire-place, a sofa, a bathroom unit including the toilet. There is a double bed, a sofa and satellite TV on the dwelling entresol. The Guest House №10 is enough to accommodate 6 persons. There is a bedroom and a living room on the first floor. In the bedroom you will find a comfy double bed. There is a sofa, a fire place, satellite TV, a bathroom unit including the toilet in the living room. On the dwelling entresol there is a twin bed, a sofa and a bathroom unit. The guest house №11 accommodates 4 persons. There is a bedroom on the first floor where you will find a double bed, a fireplace, satellite TV. On the dwelling entresol there is a toilet and two double beds. The Guest House №12 accommodates 6 persons. On the first floor there is a living room with a fireplace, a sofa, two armchairs, a bathroom unit and satellite TV. There are two bedrooms and two twin beds on the dwelling entresol. (№1, 2, 3, 4, 5) 3500 руб. руб. №7, 8, 9 4000 руб. руб. №10, 12 6000 руб. руб.